I'm just trying to gauge interest on this before I put it up on Bidorbuy. Its a suit I started working on earlier this year, with the idea of it being a display piece that I would eventually mount on a mannequin. However, I've been wanting to do a different version of the suit now, and cant afford the other parts. 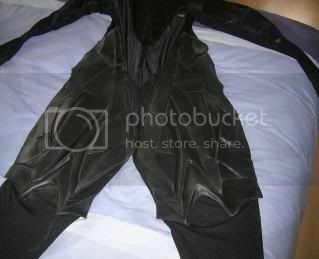 So I've got to sell the one batsuit to afford the other. I intend to strip the parts off the bodysuit and sell as is. Think there would be any interest in this? Please do not solicit business on the forum. You may list your item then post a link to it, within reason.